The self-sunk pirate ship, the Thunder, and recent research expose how insurance enables illegal fishing. The bizarre case of the self-sunk illegal Thunder and recent research show that insurers still cover illegal fishers, to the illegal fishers’ benefit. The Thunder takes on water. A year ago, the Thunder, a Norwegian-built trawler with a long record of illegal fishing, glided to a stop in a lake-flat sea off São Tomé in West Africa in perfect weather. Then it slowly sank. It was being pursued by the Bob Barker, whose crew had witnessed the Thunder using banned bottom gillnets near Antarctica for the prized Antarctic toothfish, marketed in America as Chilean sea bass. “We were astounded,” said Peter Hammarstedt, Bob Barker’s captain and a member of the Sea Shepherd Conservation Society, a marine wildlife conservation nonprofit. The Bob Barker had chased the Thunder for three and a half months to prevent it from unloading its catch. 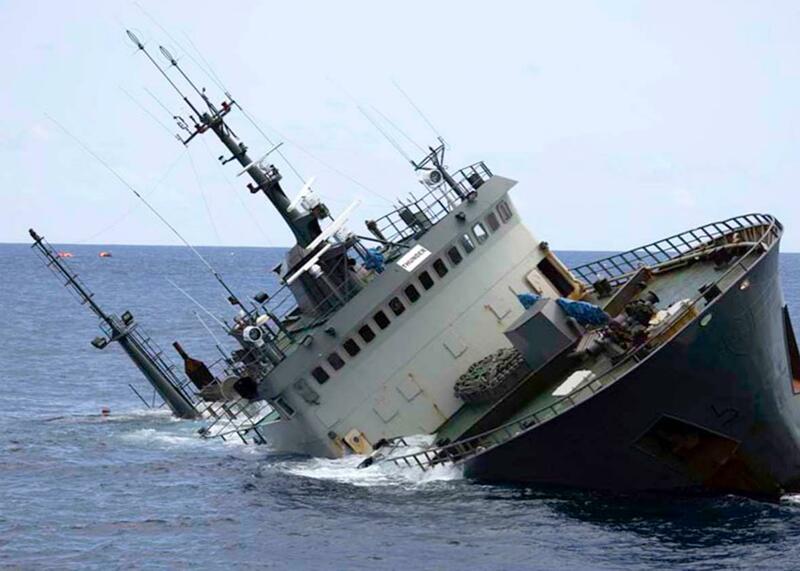 Apparently, the skipper’s crew, perhaps on instructions from the owner, decided to send the evidence to the sea bottom to avoid prosecution for illegal fishing. The Thunder’s crew stepped into life rafts and were pulled aboard the Bob Barker. Then members of Hammarstedt’s crew boarded the sinking ship and collected evidence to prove that the destruction was voluntary. “All the hatches and doors were latched open, exactly the opposite of what you’ll do if you want to maintain buoyancy,” Hammarstedt said. The boarding party returned with a frozen toothfish, Antarctic charts, mobile phones, false papers, illegal nets, a laptop, and the Thunder’s registry. “Clearly, the skipper hadn’t planned on our boarding, or he wouldn’t have left so much stuff,” he said. What’s particularly strange about this case is that the ship owner tried to collect insurance dollars for the Thunder, a pirate ship that had changed names, owners, and flags numerous times, and had been wanted by Interpol since 2013. The Thunder did in fact have insurance, by the 150-year-old British Marine Ltd. in London in 2011, and then by Murimar Seguros, a Spanish company, according to a Norwegian newspaper report by Kjetil Saeter, a Norwegian journalist writing a book about the case. The owner of the Thunder, a Panamanian shell company believed to be controlled by a Spaniard named Florindo Gonzalez, had filed a claim for the value of the ship, which the insurer declined to pay, Saeter wrote. The insurer, Murimar, did not reply to a request for comment.